In the past, while researching pitchers that had started team’s Opening Day games, I came across the name Glenn Abbott. Abbott had been the Mariners’ Opening Day starter a few times including in 1979, the team’s third year in existence. During that season, Abbott would go on to be pretty awful over 518 batters faced. Notably, he struck out just 25 hitters that year, a 4.8% strikeout rate that I found fascinating in its ineptness. Late last week however, Jeff Sullivan reminded me of the 2003 Detroit Tigers and a Lookout Landing reader noted Nate Cornejo’s season that year in which Cornejo fanned a mere 46 hitters over a larger 842 batter sample. Amazingly, Cornejo netted 1.9 WAR that year. Cornejo’s strikeout rate was superior to Abbott’s by a touch, but it struck me that because of the changing nature of the game, with strikeouts more frequent in 2003 than in 1979, that Cornejo’s season was perhaps worthier of enshrining. Once I arrived there, I had to complete the dig. And so it was time to turn to Retrosheet and some database work. 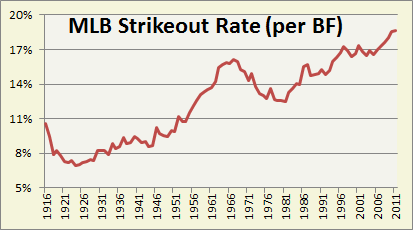 The absolute worst strikeout season, viewed against the league average, had to be found and I was going to do it. The process was actually simple. For each year beginning in 1916 and going through 2011, I computed the league average strikeout rate (per batter faced) and then went about finding the pitcher in each season with the worst overall rate. Take that list and sort it by the relative rate (the pitcher’s rate divided by the league’s rate) and you have the all time worst season. At first I set the batters faced cut off at 250 and at that level there is a clear winner (loser?). Baseball fans, meet Ted Wingfield and his 1927 season for the Boston Red Sox. I anticipate little disagreement that over that many batters faced, it’s difficult to surpass a single strikeout. For the record, the MLB strikeout rate in 1927 was 7.3%, so Wingfield’s 0.3% was just 4% of the league rate. Two hundred and fifty is a low cut off though. After all, Cornejo is the inspiration here and he pitched a full season so I upped it to 650 batters and found Bill Beckmann. In 1939 as a31-year-old rookie with the Athletics, Beckmann posted this stat line. After Beckmann is Slim Sallee in 1919 who had one of the rare feats of appearing on these lists and yet still being quite successful. Sallee didn’t strikeout much of anyone, just 24 of 893 batters, but he also didn’t walk much of anyone either with just 21 free passes allowed via walk or hit batsman. Right after Sallee is Cornejo’s 2003 season, easily the worst mark since World War II. However, he almost didn’t get to keep this dubious honor for long. Kirk Rueter in 2004 came close to matching Cornejo’s penchant for no strikeouts and amazingly, Rueter got another shot in 2005 and almost blew right past Cornejo that year. He had just 25 strikeouts in 2005 but only faced 489 batters. At his rate, he would have ended up with just 30% of the 2005 league rate, markedly worse than Cornejo’s 33% figure in 2003, worse than Sallee in 1919 and Beckmann in 1939. Kirk Rueter’s 2005 was on pace to be the worst relative strikeout season ever. Tomorrow will see the other side, with the best seasons ever, but for now which one of these is the worst? All of the above are fair designations for the title of worst ever. It’s ultimately dependent on where you set the cutoff. Personally though, Ted Wingfield’s one strikeout stands out the most to me. We hoped you liked reading The Worst Relative Strikeout Season Ever by Matthew Carruth! Is The Phillies Offense Good Enough? Using Baseball_Reference, it looks like either Max Bishop (awesome superhero name), Chick Galloway (only in the ’20s), or Lefty Grove (I sure hope his only K was vs a pitcher). Damn, I was wrong. Overlooked the bottom of the order/figured Wingfield started the game. So yes, either Bishop, Galloway, or Grove. Good catch, sir. I would kind of doubt it’s Max Bishop — Bishop was known for having one of the best batting eyes of the era. Possibly ever, if you think about it — not many other guys with OBP’s 57 points higher than their SLG over their careers. Baseball Library has Ted Wingfield striking out Chick Galloway with 2 outs in the sixth inning of the Sox-A’s game in 1927. It was in Wingfield’s third-to-last start in 1927 against the Philadelphia A’s. Max Bishop led off and played 2B for the A’s and went 0-for-3 with 2 BB’s, 1 K, and 2 runs scored. Bishop posted a 113 wRC+ that year and the following year exploded for a 133 wRC+ which was his career high. For more perspective, Bishop and Tigers great Charlie Gerhinger both had 113 wRC+’s, so Wingfield K’d a mid-tier second baseman. I know it was different years and leagues, but it would have been so perfect had the only K been of Moonlight Graham.